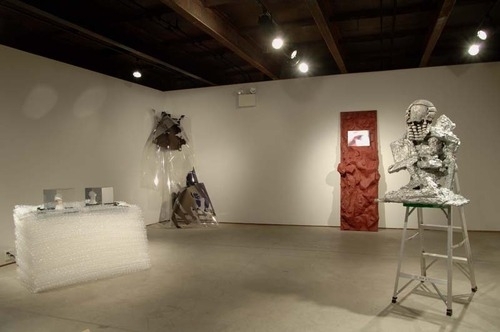 “Make It Now: New Sculpture in New York,” the title of an exhibition of work by nearly 30 artists at the Sculpture Center in Long Island City, Queens, comes enticingly close to echoing Ezra Pound’s famous exhortation to “make it new.” But the name, like the show itself, swerves at the last second, as if fearful of overreaching. The exhibition plays it safe with a lot more now than new. But you have to start somewhere, and it has a reasonable quota of intriguing beginnings and of promising parts not yet made whole. Advocating the new may sound like an old modernist saw, but I suspect that the urge for newness, difference — or whatever its current designation might be (“institutional critique,” for example) — is one of the things that continue to get most artists out of bed in the morning. First make your work new for yourself. Then, size up the extent to which your effort already exists in the culture. Finally, get back to work. “A poem that communicates something that’s already known to a reader is not really communicating anything,” is how John Ashbery once put it. These words are germane to the Sculpture Center show, where there is too much exploring of known terrain. Vincent Mazeau and Matthew Ronay revisit Surrealism. Sol Sax’s six life-size figures, which hang upside down like bats in the stairwell, reiterate the angular, rough-hewn figurative sculpture style of artists as disparate as Stephan Balkenhol and Alison Saar. The show is a condensed, more focused version of “Greater New York,” P.S. 1’s sprawling survey of local art. It was culled from some 200 studio visits by Mary Ceruti, the center’s executive director; Anthony Huberman, its curator; and Franklin Sirmans, an independent critic and curator. Their selections give a partial account of the art form that, since the late 60’s, has been the shape-shifting medium par excellence. Call it the sculptural diaspora. As told here, the main tale of recent sculpture is the back and forth between the old-time modernist art of assemblage and the more rigorous, concept-driven postmodern practice of appropriation. Since the mid-1980’s, when Neo-Geo pushed appropriation into three dimensions, these two forces have invigorated, competed with and thwarted each other. There’s little here that doesn’t fall somewhere between their increasingly blurred extremes, little that doesn’t result from the hunting, gathering, purchasing, arranging and titling of familiar objects and materials. The Scylla and Charybdis along this line are mindless materiality and overly mindful scrawniness — meticulous craft at the service of weak ideas and big thoughts that gloss over a lack of attention to physical materials. File under “mindless materiality” Jean Shin’s tower-like spires of discarded amber-plastic pill bottles, coyly titled “Chemical Balance”; Andrea Cohen’s bricolage of wood, Styrofoam and plastic, which resembles something by Sarah Sze only much larger; and Bryan Savitz’s expertly made cut-cardboard sculptures, which drown ideas about history and architecture in cuteness, technique and eye-numbing consistency. Fritz Welch’s gnarly room-size assemblage made from neighborhood junk might be the remnant of an early Happening, except for the way it seems to erupt from a ganglia-like wall drawing.